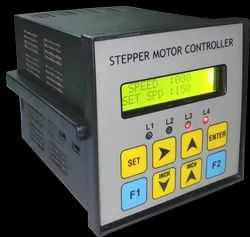 We are a leading Manufacturer of stepper motor controller and safety light curtain from Mumbai, India. We are an acclaimed name betrothed in manufacturing and supplying our precious clients a highly efficient Stepper Motor Controller. This motor controller is manufactured by inculcating modernized technology in sync with prevailing market norms of quality. Our range is having high torque density, rugged design and long life bearings. The offered motor controller has high torque to inertia for quicker start and stops. Clock Frequency 0.. 400 kHz max. Excella make programmable safety light curtains comprising of Transmitter and Receiver. This is solid state design, given guarantee of long life with minimum maintenance. The instrument has separate transmitters and receiver of operating modulated beam mode. This gives precise and reliable detection. • Self checking circuitry monitors system failure. • Provision for any number of channels to be enabled or disabled at the field. • High precise and reliable optical safety light curtain to operator's safety on machines like cutter, shears, brakes and presses etc. Supply Voltage :24 V DC 950 mA. Range of Operation:0.3 to 4 mts. main Obstacle : 22 mm to 40 mm depending on distance between transmitter and receiver. Cable Length : 3 Mts.